At 1847 on May 27, 1945, Ensign Katsumi Shinobe took off from Kanoya Air Base as pilot in a two-man Shiragiku trainer carrying two 250-kg bombs. He was a member of the Kamikaze Special Attack Corps Kikusui Unit 1st Shiragiku Squadron from Kōchi Naval Air Group. He died in a special (suicide) attack off Okinawa at the age of 22. He was from Hyōgo Prefecture, attended Ōsaka Technical College, and was a member of the 13th Class of the Navy's Flight Reserve Students (Hikō Yobi Gakusei). Are you two both studying hard? Finally it has come about that your uncle will participate in a military operation. Moreover, I will go to make a taiatari (body-crashing) attack into an enemy ship as a Special Attack Corps member of the Kamikaze Special Attack Corps Kikusui Unit. Absolutely not returning, the day is coming near when I will display hisshi hitchū (certain-death, sure-hit) fighting spirit in a taiatari attack. I will bury a ship of those hated, hated Americans at the bottom of the sea. The elementary school children in Okinawa have gone and fallen as part of an attack unit. So as to not be second to the children in Okinawa, please do your best in the Empire's defense. Please obey the words of Grandfather and Mother. I pray that you exert yourselves more than enough in the duties of young citizens in the Empire. I will go and fall as a cherry blossom in the Nansei Islands . You two, both take care. Takehiro, Yōko, grow up forever for the Emperor. The letter comes from Matsugi (1971, 177). 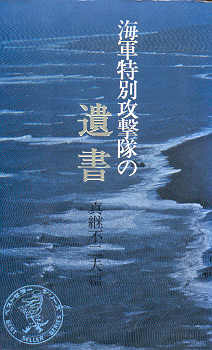 The biographical information in the first paragraph comes from Matsugi (1971, 177) and Osuo (2005, 241). 1. The Nansei Islands include Okinawa and several smaller islands that stretch southwest from Kyūshū to Taiwan.